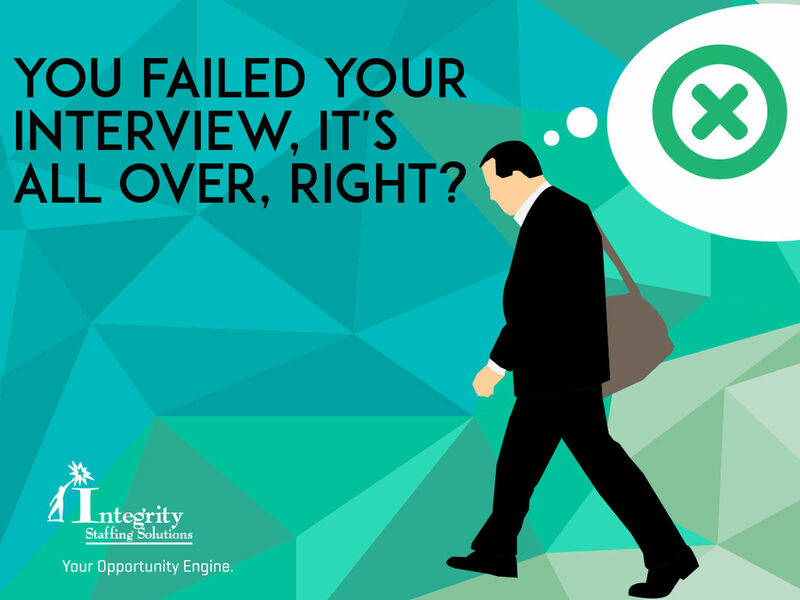 Integrity Staffing Solutions – You Failed Your Interview, It's all Over, Right? Home>Blog>You Failed Your Interview, It's all Over, Right? You Failed Your Interview, It's all Over, Right? Not necessarily. Recruiters understand that the pressure of the interview situation makes it nearly impossible not to mess up some way, somehow, and really don't expect you to be perfect (unless you're applying for the job of brain surgeon). So maybe it's not as bad as you think, and maybe you still have a chance at this job if you do a little damage control. The most important thing is not to give up and just walk away. Even if this job is a lost cause, you never know when you might meet this interviewer again, either for a different job at the same company or for another company that the interviewer has moved to. Do you want to leave the impression that you're a quitter? Here are 3 steps you can take to try and recover from your mistake. Analyze what happened and exactly what you think gave the interviewer a bad impression. Stick to definite feedback that you received during the interview, not just a "feeling" that something you said wasn't received well. No point in apologizing for things the interviewer may not even have noticed. Your follow-up thank-you letter/email — which you should send the next day — is your chance to repair any omissions and mistakes. Try to put a positive spin on answers you now regret. "After our interview, I realized I might have given the impression that my last employment was a negative experience for me. Actually, I learned valuable lessons from the challenges of..."
If your mind went blank and you left out important information about your qualifications, give the answer you wished you had then. "I was thinking more about our discussion of ways the company could use guerrilla marketing, and during my internship at Media Corp. I had the opportunity to..."
Believe it or not, letting the interviewer know you realize your mistakes and want to learn from them, could make a more positive impression than the cookie cutter letters everyone else sends. You could even come right out and ask how you might have done better. You'll come across as honest, willing to make an extra effort, open to suggestions and eager to improve. Even if this opportunity is a write-off, take these 3 steps after a bad interview and they will help you grow to be a better interviewee. What's more, you'll have gained the respect of your interviewer. And that just might pay off big in the future!